The Abia State Commissioner of Police, Anthony Ogbizi said lethal weapons including petrol bombs and one double-barrel gun, were recovered during last weekend's raid of the Afaraukwu, Umuahia’s home of Indigenous People of Biafra (IPOB) leader Nnamdi Kanu. Ogbizi, who disclosed this on Thursday said the petrol bombs were found in buckets. Also found were incriminating documents and letters concerning IPOB’s activities. He said the raid was carried out after an intelligence report regarding the continued activities of some members of the group. The police chief said the team also discovered the telephone numbers of the group’s zonal coordinators. He said a suspected member of IPOB was being held while a Biafran flag was also found hanging on a telecommunications mast in the area, adding that the Nigeria Communications Commission (NCC) will sanction any telecommunication company that allowed its mast to be used to hoist Biafran flags. 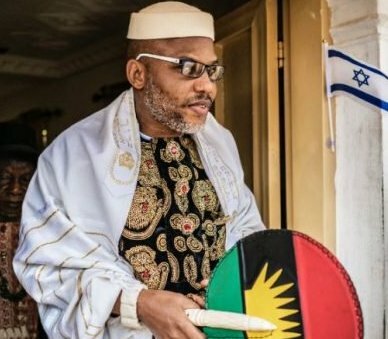 Ogbizi said similar joint operations would be carried out intermittently in Kanu’s residence, anytime the police received intelligence reports that offensive weapons were brought to the place.